With the release of Zoo York’s King Of New York, we got Zoo’s veteran photog, Sean Cronan, to give us the scoop behind some of the ill flicks he shot during the filming. Click on through to get a dose of that New York State of Mind and peep KONY again! This was shot at the spot in Queens where Brandon did the frontside flip off the bump over the fence. This was our third day going to this spot to get the frontside flip. There were always tons of people bumbling around on the sidewalk, which made it a constant waiting game for Brandon to try the trick. This lady had this full sheet of plywood balanced on her cart, and was taking forever to get down the sidewalk, so Brandon offered to help her carry the plywood to the building on the end of the block. She only spoke Chinese though, so the building on the end of the block turned out to be five blocks away. 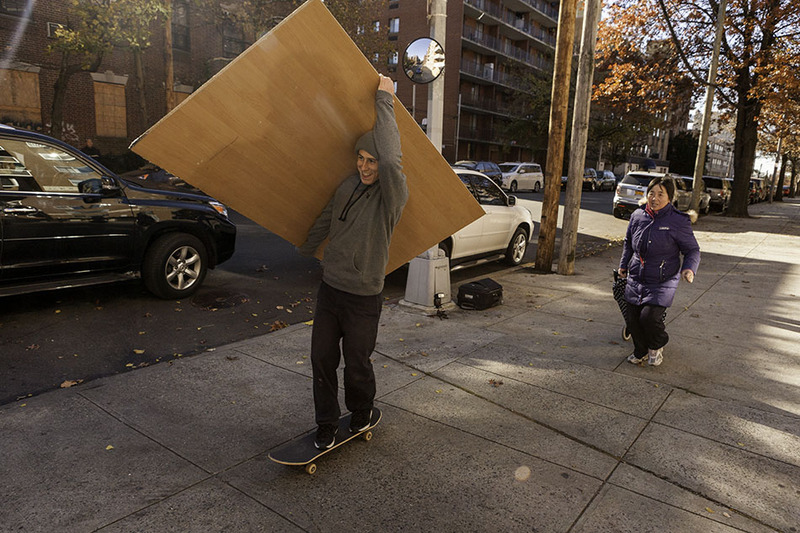 He carried the plywood up a bunch of flights of stairs and into her apartment. It ended up being good karma though because he landed the frontside flip shortly after. This was shot in McCarren park in Williamsburg, Brooklyn which also happens to be the center of the hipster universe. This ended up being the last spot on a day when all the other spots we went to ended up being a bust. 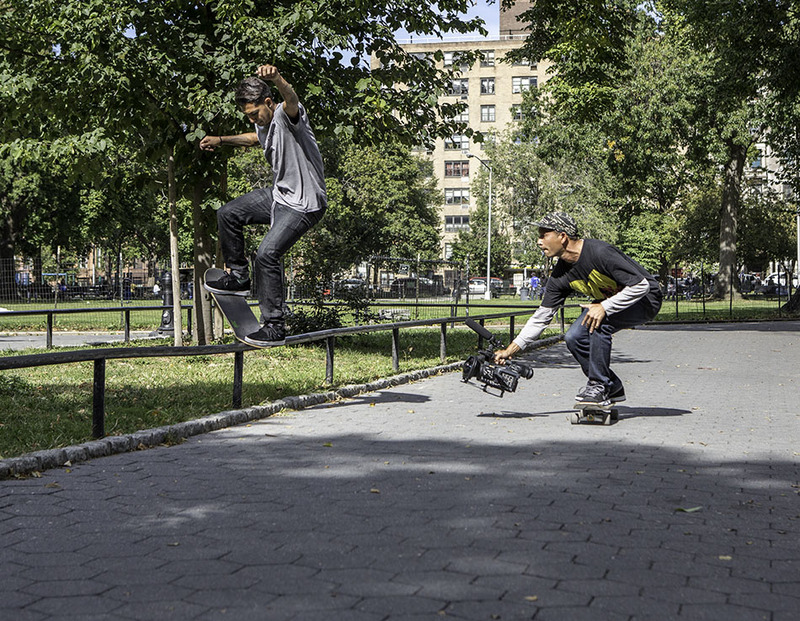 Brandon always tries to get something on the days that he skates New York. Otherwise the roughly 4-5 hour drive each way that he makes from his house is in his words "a complete waste." Ricky Oyola and Brandon Westgate: Two East Coast legends bombing down an avenue in NYC. This was literally the first trick that Ricky had done in exactly a year after having surgery. I would have never known that he hadn't stepped on a board in a year if he hadn't said anything, cause this was first try over the hydrant just like old times. Ricky then proceeded to push around midtown at high speed while Westgate and I struggled to keep up. Watching Ron Deily skate always brings a smile to my face. Every time he steps on his board it looks like he’s having a lot of fun, and isn't that why we all started skating in the first place? This spot, like most other spots in the city, is really difficult to skate, yet Ron managed to skate it like it was a regular quarterpipe down at the local skatepark. Usually you can only get one or two tries at this spot because it’s right in front of a fancy hotel with doormen that kick you out immediately. It turns out that Kevin Tierney had gone to highschool with one of the doormen and he used to skate, so Kevin was able to get enough time to make this boardslide happen. BD is one of the hardest working guys I know. From skating, to working a full time job, to flying around the country rapping, I don't know how he finds enough hours in the day to make it all happen. Dave, like Chaz, is recognized everywhere we go in the city. "Its Black Dave!" somebody will yell, kids will crowd around, cell phones out, pictures are taken, and everyone is stoked. One of those spots that is a lot harder to skate than it looks, thanks in part to the downhill landing. Travis Glover never seems to get rattled though, whether he is trying to land a trick, or telling the story about how his beloved Mitsubishi Lancer just got totaled while he was out driving a few days before. This is at Marcus Garvey park up in Harlem. It's a great spot to skate if you go early enough in the day. Preferably before school gets out. Just try not to piss off the people playing chess, as they are the ones that will gang up on you and kick you out. It constantly amazes me how many people recognize Chaz. Whether he is getting Gatorade at a bodega in the Bronx, standing in line at a Starbucks on the upper west side, or skating a ledge in the projects in the LES, people are always coming up to him asking to take a picture with him. We were at this spot for a few hours one morning, and at least five different people got photos with Chaz, from a couple of skaters, to a few random people passing through.